There are a lot of things I liked about the Tony Award-winning musical “Falsettos,” now at The Ahmanson Theatre. I fully understand why it was nominated for five 2017 Tony Awards, including Best Revival of a Musical, however at almost three hours long, with 37 songs by composer/lyricist William Finn and playwright and director James Lapine it needs to be cut down to 120 minutes for this LA audience. The two-member cast of Millennial Poison Theatre Company’s inaugural production of the visceral love story, “Gruesome Playground Injuries,” at Richardson’s intimate Core Theatre delivered an energized, compelling and authentic performance. Fueled by equal portions of pain, passion and playground injuries, stars Michael Breath Jr. and Shelby Priddy wove together an introspective story of a maturing friendship and love which can withstand the physical and emotional pain life often throws our way. Shawn Stalter, Millennial Poison Theatre Co.
It’s risky business for a theatre company to stage unknown/new works. There is no telling how the audience will react. In the case of The Value of Moscow (written by Amy Dellagiarino), the risk payed off. Dark Horse was able to put forward a very entertaining, fresh piece of theatre. The plot is described as “Three grown "adult" sisters are thrust back into living together as a last resort after their various lives have fallen apart”. It makes many allusions to Chekhov’s play Three Sisters and takes inspiration from many of his other works as well. Just like a true Chekhovian work, the play deals with numerous serious events/themes but is, at its core, a comedy of life. Part farce and part family drama, the show has something for everybody! With a book, music, and lyrics written by Debra Cook, “Jilted to Perfection” tells the story of a divorced Mormon mom and her growing relationship with a scientologist actor/director. Through this relationship she takes many risks, makes many sacrifices, and watches her life change before her eyes. Told mostly in a monologue with songs throughout, Cook takes us through her life in this new musical. In a world enraptured equally by Game of Thrones and Fox News politics, female leaders vying for a place in the history books being pitted against each other is nothing new. In this fresh take on perhaps the world’s most iconic sister rivalry of Mary, Queen of Scots vs. Elizabeth I of England, Mary Stuart examines female leadership under the eyes of family, politics, and religion in a production fit for a Queen. There has always been something about Michael Frayn’s three hander ‘Copenhagen’ which has always intrigued me. West End actors were keen on performing the piece. I don’t want to spoil the plot, but one of the characters mentions an important context involving all three which made me gasp along with other audience members sitting around me. After seeing Soulpepper’s production of Mr. Frayn’s complex play, tautly directed by Katrina Darychuk, I’ve now understood its fascination for actors and their desire to add this production to their resumes. I am so glad that I got up that morning because the beautiful Chilina Kennedy as Carole King and an extraordinary company put a smile on my face at the terrific opening night of ‘Beautiful: The Carole King Musical’. I’m still grinning as ‘Beautiful’ is that feel good show we all need right now. From my high school days in the late 70s, I can recall in my French as a Second Language class the story of Marie-Joseph Angelique, an enslaved Black woman, who was publicly executed for supposedly setting fire to various residences in the merchant area of Montreal (including that of her owner’s along with a hospital) in 1734. ‘Angelique’, now on stage at Factory Theatre, uses the backdrop of 1734 New France to mirror our modern culture. In her Director’s Note, Ms. Corbeil-Coleman quotes Nelson Mandela: “The way that a society treats its prisoners is one of the sharpest reflections of its character.” Richard Rose has cast four stalwart performers who bring to life bravely the hardships existing in the prison system. ‘Guarded Girls’ is a definite must see as we try our best to continue to break the cycle of the injustices found therein. ‘The Chemical Valley Project’ is an important social justice issue that needs to be seen by as many people as possible. Might a touring school production possibly be in the minds of producers because it is an important work that needs to be seen by young people. As this opening night production was my first visit ever to an opera, I will be honest in stating that I had no idea what to expect. Yes, a bit of trepidation and some hesitation as well - Would I get it? Would I enjoy it? Would I return to see another opera? Much reflection last night on the GO home and today has led me to understand that Sir Lloyd Webber’s ‘The Phantom of the Opera’ pales horribly in comparison to this remarkable genre. I hold no background whatsoever in opera so I will not make any comments on the singing except to say that it was exceptionally superior to anything that I have heard before. I will make comments on the theatricality and the staging of the production. A quick review of the synopsis of ‘Idomeneo’. This Greek hero (an exquisitely vocal Colin Ainsworth) is forced to choose between the life of his son, Idamante (electrifying work by mezzo soprano Wallis Giunta) and a promise made to Neptune, the god of the sea (an impeccably buffed Douglas Williams combined with his flawlessly vocal bass baritone). Throughout this tale, the audience is also introduced to other characters involved in love triangles, broken hearts and chance meetings all sung in glorious arias with every inch of the stage used for a striking and emotional impact for the eyes, the ears and the heart thanks to Marshall Pynkoski’s careful direction. In an opera, I discovered that even a slight movement of a singer or dancer can convey nuanced character development within seconds. 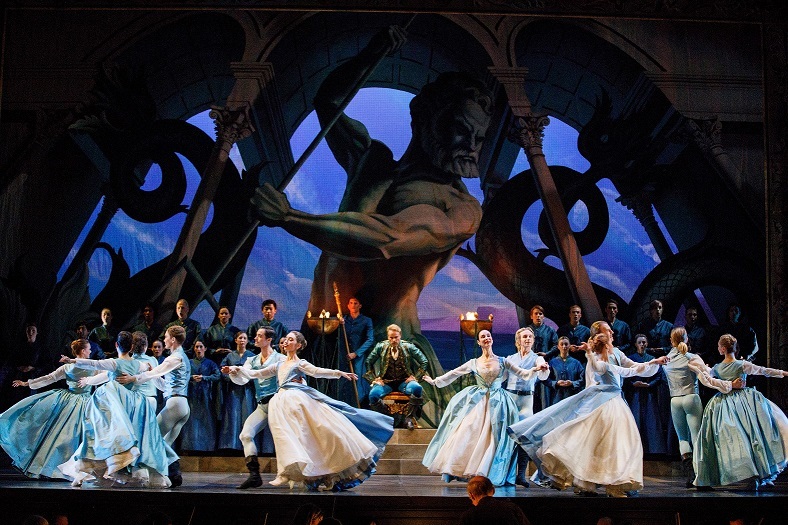 Visually, this production of ‘Idomeneo’ excels. Jeannette Lajeunesse Zing’s choreography of the dancers is marvellously impressive and fluid. Michael Gianfrancesco’s stunningly gorgeous costume designs made me pay careful attention to each principal singer and dancer. Jennifer Lennon’s lighting design was tautly sharp to superb effect. For me, tremendous emotional impact was felt from the clearly defined spot light for an aria in one moment while in the next I was swept away in a lush palette of colours for special effects in entire company movements. Gerard Cauci’s set design immediately captured my attention when I sat down before the performance began. I was immediately transported to another world from long ago and I wanted to enjoy every moment I was there. An opulent and lavish scrim painting of stormy waters made me note every single colour I wanted to take in before the performance began. Further paintings of a three-dimensional setting of a palace room with burgundy red walls created a world of ornate taste. In Act Three, Mr. Cauci’s scrim colour design of the outside of the palace with fountains suggested the hopes that all will be well with all as the story and plot progressed. I have always wanted to hear soprano Measha Brueggergosman sing and one item on my bucket list was ticked opening night. Her performance of Elettra is divine. Meghan Lindsay’s Ilia is sweetly demure in her growing affection and eventual burning love for Idamante. In the third act, Ms. Lindsay’s vocal work was wonderfully demonstrated in a moment where she will do anything for Idamante and his love. One of the highlights of the evening for me was hearing the breathtaking work of the Chorus under Daniel Taylor’s Chorus Master. At one point, I was so engrossed with the action on stage at the top of the production, I couldn’t figure out where the chorus was singing. My guest gave me a slight nudge and told me to look up in the boxes Stage Left. Wow! How did they enter so quietly before their moment to sing? Nice work indeed to not draw attention to themselves. Final Comments: Would I attend another opera in the future? Yes, I probably would, but I would most certainly try to read as much as I can about the plot before I attend. When I return, I know that I won’t feel hesitation in wondering what I am about to see. If I did have one very minor quibble as a first-time attendee at an opera, it would be the fact that I was trying to pay close attention to too much all at once. At times, I felt as if my brain, thoughts and ideas were in overload as I was trying to cram in so much to remember from this experience. I’m certain I won’t feel this same way the next time I attend. If you’ve never attended an opera, I invite you to at least try a different experience. It was an enjoyable evening. I might not have got everything from the story, but at least I appreciated very much what I saw presented before me. ‘Idomeneo’ runs to April 13 at The Ed Mirvish Theatre, 244 Victoria Street, Toronto. For tickets, please call 1-416-872-1212 or visit www.mirvish.com. Running time is 2 hours and 55 minutes with one intermission. ‘Idomeneo’ is performed in Italian with English surtitles. The Cast: Colin Ainsworth, Measha Brueggergosman, Bradley Christensen, Wallis Giunta, Olivier Laquerre, Meghan Lindsay, Douglas Willliams. Conductor: David Fallis, Director: Marshall Pynkoski, Choreographer: Jeannette Lajeunesse Zingg, Set Designer: Gerard Gauci, Costume Designer: Michael Gianfrancesco, Lighting Designer: Jennifer Lennon.